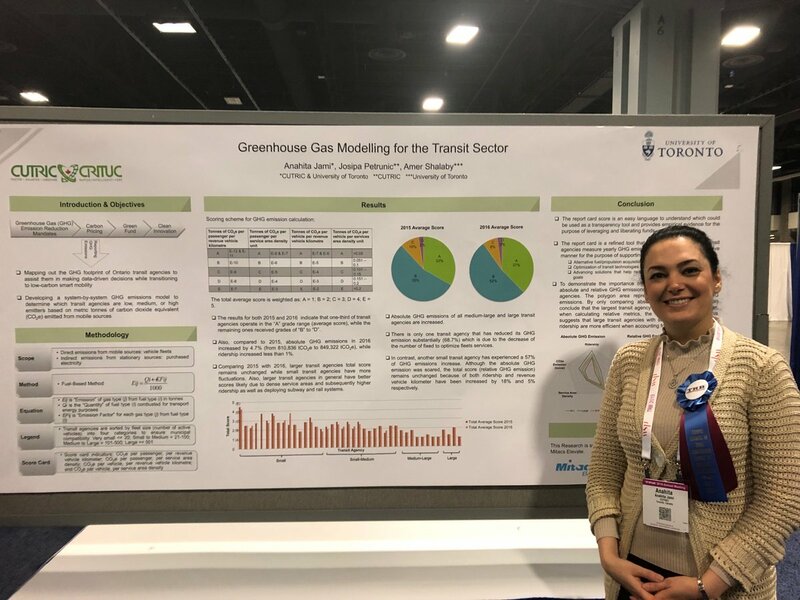 Congratulations to Dr. Anahita Jami for being voted “Best in Session” by the Standing Committee on Public Transportation Planning and Development Poster Contest at the 2019 TRB Annual Meeting. The research paper “Greenhouse Gas Emission Modelling for the Transit Sector” was authored by Dr. Jami, Dr. Josipa Petrunic of CUTRIC, and Dr. Amer Shalaby of UTTRI. For more information, please email Dr. Jami directly at anahita.asadolahniajami@utoronto.ca. Dr. Jami is Research & Program Manager at the Canadian Urban Transit Research & Innovation Consortium (CUTRIC) and a Postdoctoral Fellow at UTTRI.